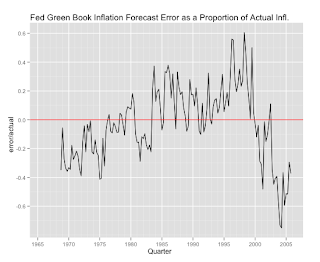 I'm putting together some descriptive statistics for a project (with Cassie Grafstrom) on the forecast errors that Federal Reserve staff make. Is there anything systematic about it? 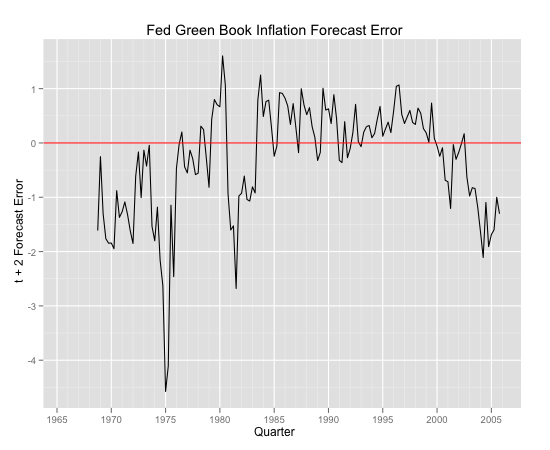 Our forecast data are from the Fed's Green Book, which is produced before each FOMC meeting. 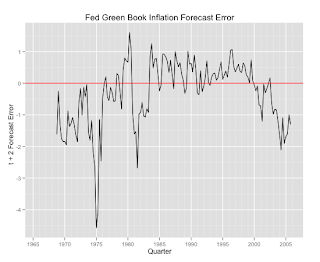 I've created a graph of quarterly forecast errors (simply Forecasts Made 2 Quarters in Advance - Actual Inflation from the Federal Reserves FRED database. Also, forecasts are compared to GNP/GDP deflators and chain-type price indexes, based on changes in what inflation indicators the forecasts are trying to measure across time). 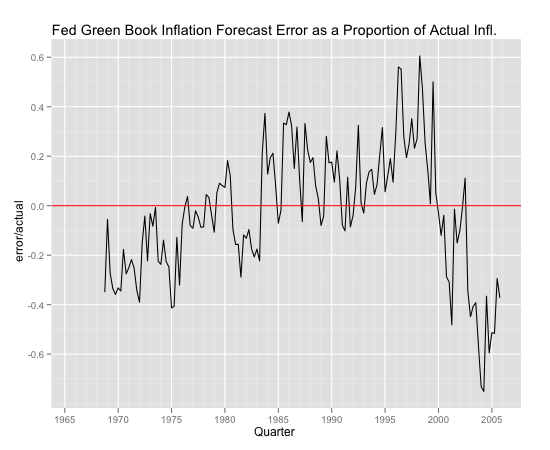 From this graph it seems like the Fed has gotten much better at forecasting inflation two quarters out. However, this is a bit misleading since the absolute level of inflation varies considerably over this time span. In the early part we have the stagflation period with high inflation. Then from the start of the Volker Fed in 1979 absolute inflation decreased. To deal with this problem I simply standardised the errors by making them a proportion of absolute inflation. It was then more likely to over estimate than underestimate until around 2000. From around 2000 it tended to drastically underestimate inflation. The first two observations correspond to what Capistrán (2008) found. However his data didn't go past the late 1990s. The last observation is fairly interesting since it coincides with a period of the Fed steadily lowering the Fed Funds Rate. More work to follow . . .